· FOeng. 1, clix "hicill ingen iarain hicor corcodúibne"
· CAnmann2, Imleabhar II, 88 "Corc Duibi .i. Duibfhind ainm a máthar a quo Corco Duibne"
· CGH, 354f25 "Corco Dubni mac Carpri Músc athair Corco Dubni"
· Tair. 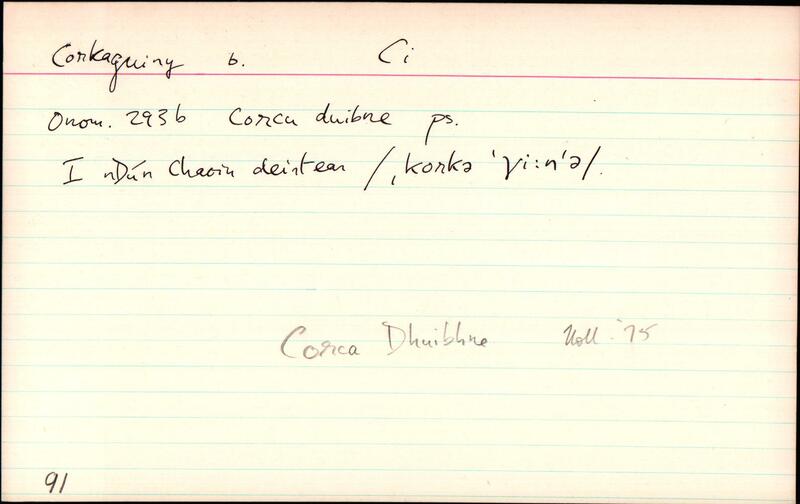 na nDessi, 104 "Corc Duibne diatát Corco Duibne"
· LGen., Alt 394.3 "Genealach Corca Duibhne do shíol Coirbre Músg"
· Ardf. Wills, 137 "Browne, Richard, Ballymoreagh, Corkagwiny, co. Kerry"